An experiment with colour,technique and brushstrokes. With several exhibitions coming up I am working on my new collection for the Market Street Gallery show in Alton, Hampshire which opens in March. I have had interest for more cockerels which now seem to have a life of their own in my studio! Popular subjects are constantly being asked for although I always aim to have a few surprises in each new exhibition to keep my " Expect the Unexpected with this Artist !" image alive! I also have requests for a series of pheasants. As an artist who paints freely I prefer to avoid commissions and paint directly from my heart. This allows me each day to create with emotion the subjects I enjoy minus the pressure of having to paint a possible piece that may not appeal to me. In this case I have luckily fallen madly in love with pheasants so they will happily play a part in this next collection! Working with colour and Asian brushstrokes in the next few paintings,I feel a combination of East meets West techniques will work really well. I couldn't leave my blog without some sunshine here. So to make up for my previous sad post here are some tulips I am working on. 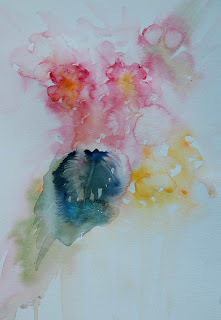 The aim is for soft flowing colour throughout each new painting. At the moment this is nothing more than my way of playing allowing my way of working to lead me into a collection of ideas. I am delighted with the soft appearance of the flower heads. The misty background adds interest too like soft hazy morning sunlight. This close up gives an insight into the light source playing on the stems in sections. Little detail and yet enough is here to make each flower magically appear. It is amazing how a wonderful high can see you very quickly come crashing down to earth in tears. Following the successful meeting with my publisher this week I have found myself racing my beloved dog Taffy to the vets and then on to a wonderful hospital outside Winchester in Hampshire. He is now undergoing tests to confirm he hasn't got cancer. The last twenty four hours seem a blur of tears and worry. Taffy has lived all over the world with me. He has seen camels in Dubai, learned to adore rice in Hong Kong, even fell in love with a French Poodle in France where he herded sheep for the very first time and later spent a year in Belgium admiring waffles which he used to sneak from time to time. My studio this morning seems empty without him nudging my arm to let me know I have been painting or typing for far too long.This painting eased my mind in a way that brought me together with Taffs even though we are apart this morning. Capturing emotion and love in a piece has never felt quite so strong as it does right now. Thank you to everyone,old friends and new who are sending me messages. 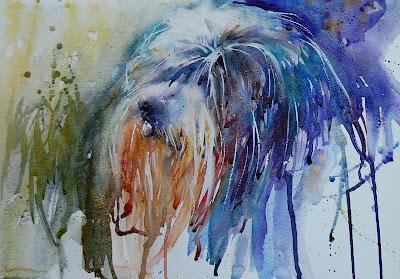 Taffy has many artist friends as well and he has appeared in many of my paintings. I really appreciate your kindness and support and for your encouragement with my book . Diary of a New Author. January 2010. Last Meeting With The Publishers! It is very hard finding the words to describe how I feel this morning. I am preparing for a trip to meet with my publishers. This will be the final meeting before my book goes to print and then becomes available later this year. All the writing, all the paintings,everything is in place and now is the last chance to make any changes. I have read the text over and over. I have considered each painting and what it is trying to convey to the reader. It has been such an incredible journey from simply dreaming about writing and actually making the jump from artist to author. I have been blessed with a fantastic publisher who has given me so much encouragement while the project has been on going. Their professional experience has made this even more of a terrific experience. One I will never forget. 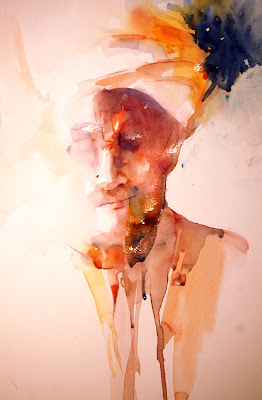 Over the years many students and artist colleagues have begged me to write and share my passion for watercolour and spontaneous technique. More recently my workshops and demonstrations have led to even more requests for a book from artists all over the world. And here I sit typing about a meeting which holds the key to any changes to be discussed before my work becomes public.Out of my hands and into yours. The feeling is really hard to describe. Excitement doesn't cover it, emotional comes close and surprisingly there are nerves too. Very unexpectedly. So many people have high expectations of me and I am begiinning to worry I may be letting everyone down if this isn't how they imagined it to be!
" Please share how you paint faces.....please make sure there is a flower painting in it, please make sure you have landscapes covered.......please have animals..........."
With so many requests and only so many pages how was I to keep everyone happy? But I have tried. I have covered as much as I can in a way I hope will be easy to digest and follow in a way to encourage readers to see as I do enjoying the joyous freedom in my brushstrokes. It is time to turn off my computer and pack. I hesitate as a thought occurs to me. Holding my first proof in my hands this morning I know the next time I see my book it will be the real thing. The copy that you will see on sale. I have to let go of what has become so precious to me over the last year and share it with the world. What a feeling. For some reason I feel very small knowing how many wonderful artists are already published and "out there". Maybe that is the most down to earth feeling to consider but I feel as though I am leaping into a future that is a foreign country to me....a new adventure where I will meet many new friends along the way. Primroses emerging after winter months. It really is interesting how the colour of the season is affecting my palette. 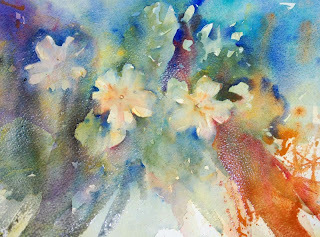 Usually I would paint primroses surRounded by soft light colours. But because these are out in winter the combination of shades I am selecting is completely different and to be honest I quite like it. 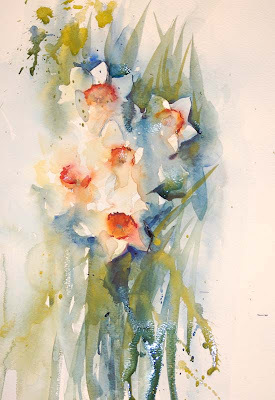 Many visitors to my studio or workshops imagine my loose style means my work appears quickly. It can at times but great thought goes behind every single brushstroke especially with delicate flowers such as these.The soft hues are vital to creating a sense of the delicate petals. The form for each flower has to be accurate or suggest that it is. This takes a lot of time and patience. 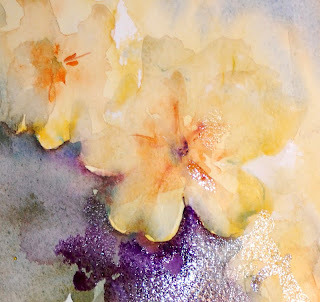 There are no pencil lines to guide me so I ofren see new flowers appearing which I work on as the painting develops. This is my style and my technique. Each petal is carefully positioned and brought to life with subtle colour combinations. Patience and a good understanding of the subject is necessary for good results. Madame Blanch Odins work is influencing me yet again. Her influence is very apparent in this painting. I am learning so much from nature. In the garden these pretty flowers were planted deliberately in rows. They look beautiful but planned. This doesn't suit them or me! As a keen gardener I often combine spring flowers in beds so that the colours create a feeling of excitement and continual interest. 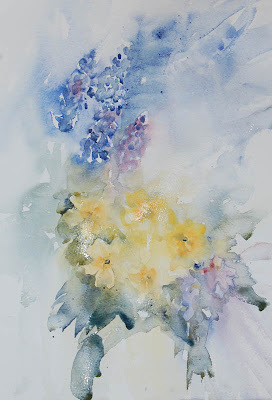 So my previous painting of primroses with muscari is a good example of garden design affecting the artists eye and vice versa. I plant for my art, I plant for inspiration and to allow me always to have colour in my life. Primroses and Muscari . a Spring Combination. For me the most magical way to see primroses in in the wild. Along country lanes, footpaths and nearby woodland when walks turn into exciting treats for the eyes as the very first buds appear.They grow in random clumps,unplanned with no deliberate design. Just flowers growing wherever they wish splattering colour all over the place brightening up the world in a way that only nature can. Seeds carried by the wind just like pigment carried by water settle at will. So why as artists do we set out to plan our paintings? Why do we spend too much time deliberately working out which colour goes where for the best results? When nature seems to do everything naturally having gorgeous happy accidents of colour combinations that are often unexpected. 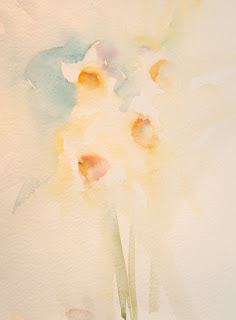 Watercolour is a medium with magical qualities so working in a spontaneous technique allows it to shine in its full glory. Maybe I have answered the question to why I adore watercolour so much. I am a free spirit. 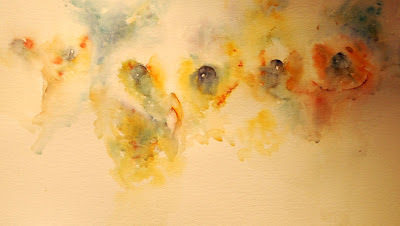 I adore surprises and working with watercolour minus the use of that word "control". I throw rules out of the window and enjoy the sheer pleasure in witnessing subjects come to life in my paintings as if my magic. Exploring new wonderful colour combinations daily often leaves me almost breathless with excitement. Beautiful primroses growing wild and free forming a wonderful flow of colour. 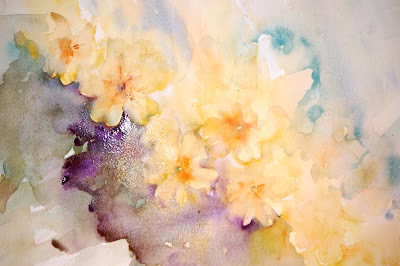 This last primrose painting sings to me. I have caught the flowers in their natural habitat surrounded by the debris of Autumn leaves with a hint of the future spring skies to come in the bright blue background. I am happy, my mood is light and this is flowing into my work. This painting holds so much in the way of hope for a wonderful year ahead, a year full of amazing paintings and hope for all around me to feel great happniess. It is amazing how one simple early morning walk can lead to a series of paintings on a whole new subject. I have been watching the countryside change as Spring nears. I love looking for the very first snowdrop which has been out for sometime now. And I love watching the very first catkins appear. They always remind me of lambs tails. Their colour in misty morning light is incredible if you take time to study them. But how do you paint them and make them seem a little bit more interesting than the early browns we so often see? First Catkins in Early Morning Light. N.B Notice the catkins that aren't even painted but are still magically there ! This painting was painted freely with no preliminary sketch and without the use of masking fluid. I attempted painting this subject last year but did not succeed in capturing the effect I wanted. Later in the year as they will become more attractive as they blossom. Then they will turn into soft fluffy catkins but at the moment they are tight long shapes that really hold hardly any interest to the artist. Or do they? 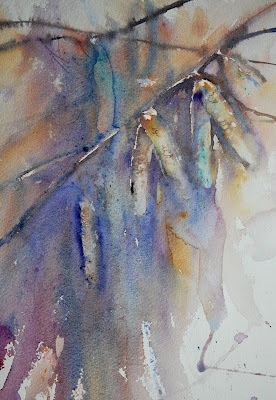 Close up of light on the branch and catkin detail. Everything I see fascinates me. I will study each shape with eager eyes looking for the light source. I will consider colour and imagine the wide variety of techniques I can use to bring everything to life on paper. This year from writing my book and taking the time to absorb my own ideas I have looked at catkins again with fresh eyes. It is almost as if someone is removing a veil from my eyes. I can see not only what I want to paint but how I want the results to be unique. 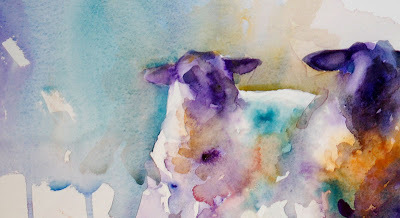 I am so excited at where my journey in watercolour is leading me and thrilled to be able to share on this blog. I carried a small twig home and painted from life. In this painting like no other before I feel an element of excitement in that I know exactly how to create drama in my next pieces. That feeling of something wonderful about to happen has hit my soul. I am awake, alive and the passion to create has never been stronger. All from taking a few minutes to really look at one simple catkin! Gorgeous Negative Shape in the Background. Chinese Brushwork plays a big part in this painting. My time studying in China is really helping me progess as an artist with a slightly more unusual combination of styles. Many of my paintings paint themselves. It really is true. 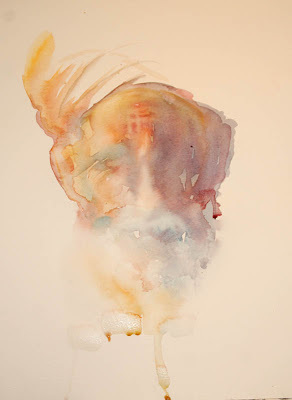 From my washes and use of exciting colour combinations a form of magic takes over. Maybe I see differently, I don't know but I am so in love with life and watercolour. And Spring isn't even fully here yet! How wonderful to see as an artist.And how wonderful to live at this time when we can share our thoughts with the world via the internet. We are really so very lucky! 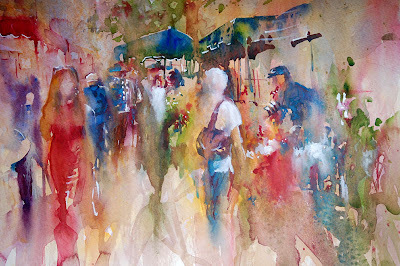 Market Street Gallery 2010 Watercolour Workshops. Winning Painting of the SAA Professional Artist of the Year Experimental Category 2009. From a private collection in the Bristish Embassy in Turkey. 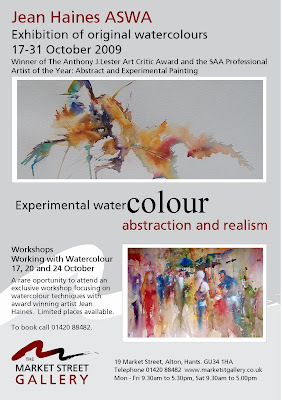 The Market Street Gallery in Alton will be hosting Watercolour Workshops during my 2010 Spring exhibition. These are more personal in that each session is strictly limited in number of artists attending. 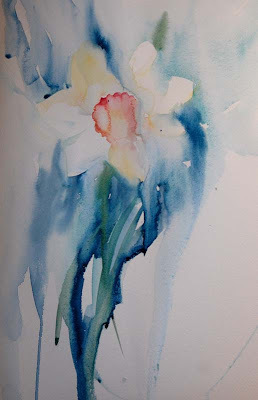 We will be looking at a variety of subjects and tecniques during the morning while the afternoon will be a time to paint following demonstrations to bring the very best out of you as an artist. We will have lunch together at a charming tea room in Alton so this is also a rare opportunity to "meet the artist" without a brush in her hand! 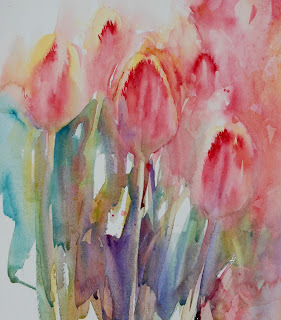 My Watercolours With Life Spring Wotkshops are fully booked so this is a last opportunity to attend a Spring session until 2011. If you are interested please book early directly with the gallery to avoid disappointment. 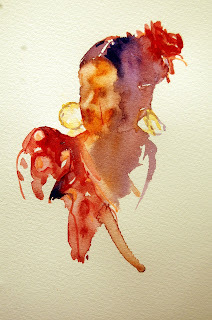 I am working on a new exhibition collection and preparing for my Spring 2010 Workshops. Working on challenges to interest artists attending each session and at the same time exploring techniques into creative use of colour. What started as a fun exercise has led me not only into a wonderful adventure but into discovering exciting results too. 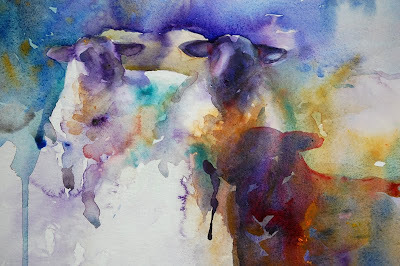 Two Sheep, a colourful first wash. I have enjoyed this painting at every stage. You may think I have worked on the background next but think again! Building up my painting and strengthening colour combinations. This is a base for a large original painting at this stage because I like it so much but I need to explore further to gain more paintings for the series. Exciting creative use of colour. At some point the painting took over letting me know exactly what should be where. More sheep started magically appearing in the background and foreground as the colour became more intense. The large painting which is purely an experiment is full of energy and life so far and I am really excited as to where the whole series could now be heading! Interestingly if you stand well back from this large painting you can clearly see sheep and form. However when you look closely at this piece you can easily see the subjects haven't actually been painted at all. Each one is made up of a collection of brushmarks and patterns. By working in an abstract manner I am slowly bringing my subjects to life. Abstract Patterns within a Painting. My favourite section is the sheep whose legs are hints of colour as they give a suggestion of the fact they could actually move and walk away. There is always one favourite section in every painting! Now to paint the whole series from this exciting beginning. Is Your Bin Full Enough Yet? I often listen to comments from artists on their own work. So many feel they cannot paint the way they want to, so many don't like their results and many often find fault in their technique.
" No matter how hard I try I just can't.........."
" I just can't paint........ boats, figures,faces,dogs or paint loose ........."
But my reply if always the same. The only thing in our way of ever achieving what we set out to achieve is ourselves. 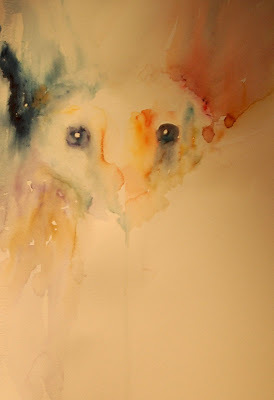 Trying too hard kills spontaneity in watercolour. So relax,smile and allow the pleasure of being able to create take over. Don't always aim for a masterpiece. Also aim for the bin.
" If you aren't getting enough good results maybe your bin isn't full enough yet! 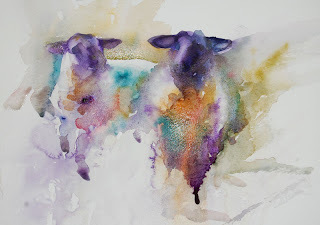 The most exciting time of the year is about to approach and I am daily recieving eager emails from artists who are attending my watercolour workshops this year or hoping to book a place. After the lull of a Winter break my palette changes and my enthusiasm rises. Tip: When booking workshops please always book early in advance as many favourite artists find their sessions fully booked months in advance. My Spring sessions were fully booked from last year! I spend the beginning of each year planning my teaching and demonstration schedule. I take time to research new shades for each season and watercolour paper for each class to try. I endeavour to make each workshop exciting and different so that returning artists always have something wonderful waiting for them to enjoy and new artists coming to me for the first time also have a little of the unexpected from a workshop. I aim always to have everyone leaving my sessions absolutely 100% inspired and eager to paint non stop when they return home. A New Year, a New Life!.........and a new way of painting! It is the memory that lingers from coming to a successful workshop that lights the passion inside every artist more than the session itself. I am addicted to painting and this addiction is contagious. 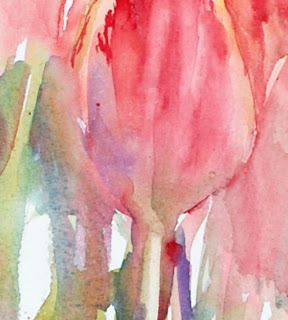 I now give everyone coming to me a warning that they will never feel the same about watercolour once they have attended one of my watercolour workshops. I have been told on many occasions that this is true! 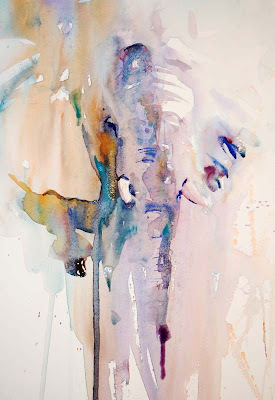 Artists who have long lost the motivation to pick up a brush,artists who have worked in detail for years and artists who want to try a loose style all find themselves on one of my sessions enchanted by what happens when we relax, open our imaginations and work with colour alone. No pencil work and no restricted lines telling us what to do or when to add a detail. It's magic! Writing features in magazines has seen a huge rise in the number of requests I am recieving so here is an update of all the Spring workshops this year. I will add Summer and Autumn workshops in another entry on my blog. There are a few places available in my Autumn Sessions, morenews on those later on! The most popular of workshops that looks at ways of bringing a subject to life using a variety of techniques to create intrerest,drama and impact in your work. A host of subjects will be covered so that each brushstroke makes a difference. No preliminary sketches are used during the workshop and every artist attending is encouraged to try something new. You may bring your favourite photographs to work from in the afternoon session. Lunch is provided and for those artists travelling and staying over an evening is planned so that you will have the opportunity of meeting everyone on the workshop. Details of the venue will be forwarded by email or given during the session. This promises to be a day to remember! A second exciting workshop covering technique to bring subjects alive in a unique and original style. No preliminary sketch. Just expressive brushstrokes and excitement in each painting! Exciting colour and patterns in unusual compositions ! A first this year. So many artists requested a workshop specifically on flowers so here it is. And the immediate popularity of this session saw the bookings fly in. A variety of flowers will be provided for the workshop so the venue will appear to look like a florists! Having said that could I also ask all artists attending to bring your favourite flowers as well just in case I miss the one you prefer to paint! Please remember in this class we will be painting from life so photographs will not be suitable. You can bring some for reference but the session depends on really seeing colour, light and shadows which are often missing in a photographic image. This can lead to disappointing results. 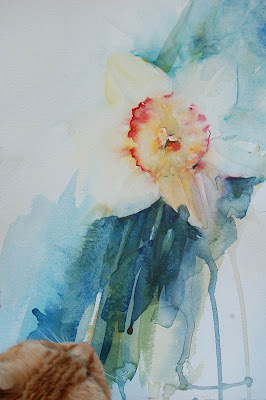 Please be warned, following this session you will never be able to look at a single flower no matter what it is without the desire to capture it in watercolour! To everyone coming I know how excited you are! I am too and so looking forward to meeting you all again for a wonderfuls day painting. Artists are travelling from all over the world for these sessions. South Africa, Italy, France and all over U.K. They are going to be brilliant! These courses are now all fully booked but I will be adding new opportunities to come to me soon! Please watch this space for latest news on demonstrations or workshops coming up. I am never surprised by life. There is a saying that in life "We are either givers or takers"
There are those who will take everything they can without ever giving back in any way no matter how small. And then there are those who give generously from their heart and soul without thinking twice. I like to be known as a "giver". This week I recieved several wonderful emails but one really made me smile. Why ? Because it was about someone else. Another artist. A budding star in the art world who I have come to know and who has attended my workshops and studio. I saw in them ages ago a wonderful gifted talent. An art contact had been searching on the internet and came across amazing talent simply because the artist had mentioned my name as a mentor and inspiration. That small act of kindness on their part gained them attention they hadn't expected. I am always touched to hear my work inspires and encourages.But I am even more thrilled to hear good news regarding another artist who in this case has incredible talent and it is a sheer joy and honour to be linked with them. I know they have a wonderful future and I was even more excited to hear that my art contact agreed. How wonderful by that small act of kindness they have been recognised in their own right. And how wonderful life is when we all give and take from our hearts.
" What goes around comes around"
Love and kindness coming back to you from giving it away has to surely be the most wonderful gift of all. Everywhere I look there are signs of Spring. Snowdrops are eagerly pushing shoots up in an attempt to be the first flower to show its' face this year. Our village florist already has a wonderful selection of my favourite flowers to paint. Spoilt for choice I decided eventually on a small posy and they soon became a magical flowing composition in my studio. The coming months will be a favourite time of year for me. 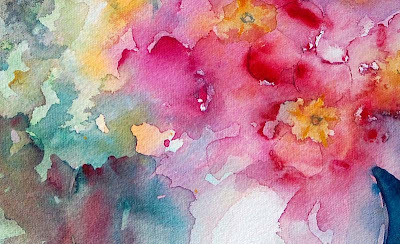 I adore painting flowers but the challenge is always to do so in a way that makes them seem as though they could actually be moving in a breeze.Or possibly you could imagine their sweet perfume as you looked at the results. It is never enough for me to simply capture the subject. It has to look as though it has life in it. I will add each favourite flower to my blog over the Spring Season and hope you enjoy the flowers as they appear. I am not alone in my passion for the flowers of Spring.One fan of my work in particular always seems to be in the way when I am working. 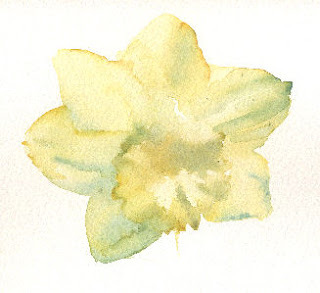 Here she is admiring a painting of a daffodil as it begins to form in watercolour. Daffodil painting developing watched eagerly by a fan. There are many artists in this world. Those who feel passionate about life and those with the exceptional ability to create. For many artists the creation is a journey which is an all consuming passion fed by the drive and enthusiasm to continually inspire and move forward to a goal of excellence. Naturally not all well known artists work with a brush in their hand. This week I met one such artist. I was invited to a function hosted by the well known and highly respected famous chef Raymond Le Blanc at Brasserie Blanc, just one of his outstanding restaurants which is located in Winchester. This event was generously hosted by Raymond in aid of the Lady Taverners, an association of which I am proud to be a member How I became a member and information on this wonderful charity I will share in a seperate entry because the work involved to help very special children deserves that honour. And so on Monday 18th January, 2010 I arrived with a painting that I was donating as one of the main prizes in the Auction which was to take place that evening. Guests were warmly welcomed by Raymond who has the charistmatic charm you would expect from a wonderful French host. I had seen Raymond on many television programmes but until now had not had the opportunity to meet him in person. I was so impressed immediately by his smile and engaging personality. He seemed to possess endless energy and the magical quality of making every single person in the room feel welcome. The time he gave during the evening to ensure it was a huge success is tribute to a man who has a truly generous spirit. Whilst the flowing champagne was superb the canapes were outstanding. A never ending array of tasteful and beautifully presented "mise en bouche" were constantly available to tempt the palette.A palette so far removed from the one I normally discuss on my blog! The art of creation is there in colour,shape,texture and of course needs to be pleasing to the eye. Presentation is the key. Raymond has mastered this skill in a way that has to be witnessed. I was tempted many times with the fine food. Looking at every guest in the room I can safely say we will all be returning to Brasserie Blanc to sample more of this excellent cuisine. Then the time for the Auction arose and we were entertained by the most charming and professional of auctioneers. When my painting was shown to the audience I waited and watched as the bids grew. There is an element of excitement at a successful auction and the moment was hanging at one point where the final bids fell between two gentlemen. It was almost like a humourous duel but I am thrilled and honoured to share the news that Raymond Le Blanc made the winning bid. 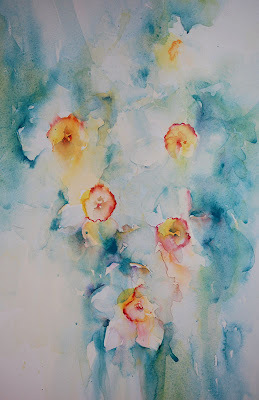 The painting was one of my original cockerels captured in glowing watercolour. These paintings are now fast becoming collectors items and this particular piece will be on display in one of Raymonds amazing restaurants. Readers of my blog may be expecting me to share the painting. You may be waiting for me to share the news of which famous restaurant it may be seen. I think its first viewing should be in the restaurant...........so please if you visit any of Raymonds fabulous venues where you all be in awe of the artistic creativity look out for my painting. Sometimes hand in hand artists can do more than create.They can also help in a way from the heart and soul bringing happiness to so many others. I wish you joy, happiness and a wonderful year ahead in 2010. Mine has already been blessed by the art of giving. To Raymond a huge thank you for a wonderfully unforgettable evening for the Lady Taverners and may the painting bring you years of Good Luck and Good fortune. "La grande dame de l'aquarelle"
When I left Dubai I moved to France before my next destination which was returning to Hong Kong at that time in my life. Only a pet owner would understand my fear of placing two beloved pets in quarantine due to a move from one country to another. My decision meant I would be living in rural France with just my dogs for company in an area in Le Gers for six months until they could travel to China. 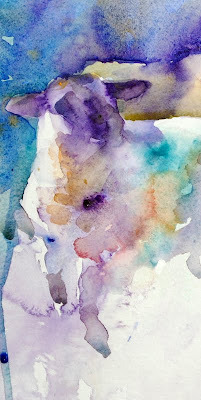 Watercolour Study by Jean Haines. Here I met many amazing new friends and artists. It was here I was given a book by Jean Louis Morelle but that is another story yet to be told. And here I fell in love with painting flowers. Roses surrounded my wonderful farmhouse and I painted them in oils mainly as that was my passion then. A gentle first wash capturing the essence of these sweet small flowers. A part of me will always remain in France. 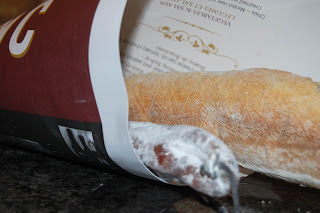 My spirit feels at one there and my life became so blissful as I embraced the French way of life. 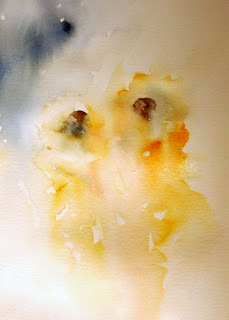 A friend and fellow aquarelliste introduced me to the work of Blanche Odin. 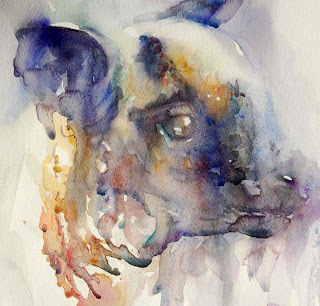 I fell in love immediately with her beautiful technique and obvious knowledge of each subject she captured in brilliantly gorgeous watercolours. She has effected my artists soul as well as my work. 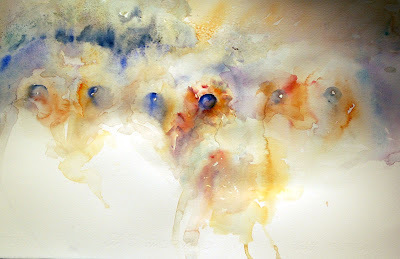 An original watercolour by Jean Haines. All artists are inspired by masters. 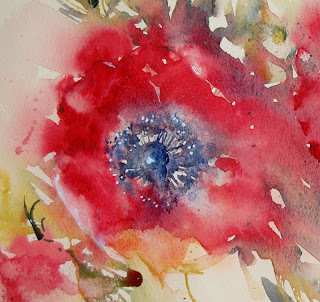 The story of Blanche Odins life is one worth taking time to discover.For inspiration and an insight into an artists life at that time please click on the following link. Here you will find the history of a remarkable artist. 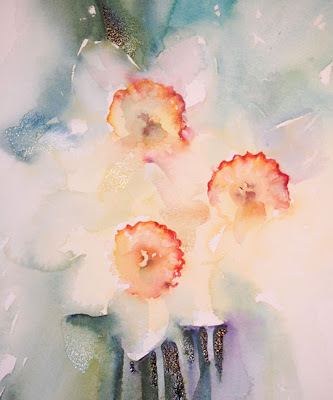 And here you will find the true inspiration behind my floral work.We may be worlds apart in style and technique.But our passion for the beauty of flowers and watercolour are in harmony. As an artist giving credit to those who have inspired you goes hand in hand with holding a brush. A kind word,a gesture of goodwill may just inspire others in their art journey. Giving back as well as taking the gift of inspiration is a sign of respect shown by many honourable artists. I choose to pass on this incredible heroine in my art life. I hope she inspires you too. On this note I would like to take a minute to thank everyone who has sent me cards,emails and messages letting me know how much I am inspiring them. These kind words encourage me to share more...............thank you so much and may your own art journey always be wonderful. A Special Day as an Author. Yesterday a large brown envelope arrived in the post. I knew the minute I read the name of my publisher what the content could be. Holding this in my hands was a moment I will never forget. Over the last year I have been writing and painting for my first book on watercolour which will be available later this year. During this time I have communicated regularly with my publisher and discussed the various stages of putting my ideas in print for the very first time. It has been such an incredible experience. The cover of any book is very important as it is the first image readers and public will see. The decision of which painting to have here has been thought over and considered very carefully. I paint so many subjects that there was a huge variety to choose from to place here. My work appeals to a wide audience and my workshops are attended by artists of all age groups,art levels and also by male and females. My favourite area to work in is colour and light. I needed an image that showed all of this. I have been asked to write on painting portraits, animal lovers want me to write about painting pets or wildlife. 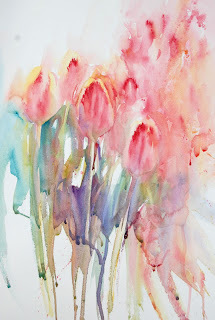 Floral artists want a book on flowers.And yet when I paint landscapes I recieve so many comments asking me for more. This made the decision of what to have on the cover even more difficult. I thought about my exhibitions and how successful they have been for a clue as to which painting could be the most exciting to feature on the cover. Galleries carry a wide range of my favourite subjects. Over the last twelve months I have sold each and every one so there has not been an indication of which is my best or most popular. All of my subjects seem to sell well. Finally a decision was made and I was about to see in print the cover of my book for the very first time. I felt nervous and excited.Would I like it or change my mind. More importantly would others like it. I had put off opening the envelope for as long as possible. Now was the moment to see how my book was going to appear when it is published later this year. My hands were probably shaking as I gently opened what was probably the most special of envelopes I have ever recieved in my life. I now have the cover in my hands. I know what my book looks like. This morning I looked again to see if this was all a dream. I am waiting to wake up. I like my cover.....I so hope you do too as I will be sharing it on my blog as soon as it has gone to print and is ready to be launched publically. And I think there should be a virtual party when this happens connecting with all my friends from all over the world. 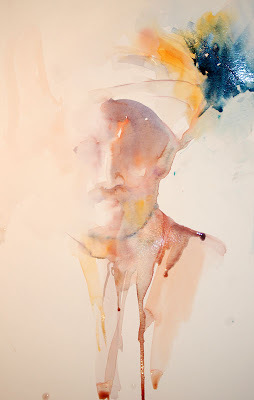 For years I have had an overwhelming passion to paint faces in Watercolour. This began in Dubai where I exhibited and sold on a regular basis. "Magic Faces" as my work quickly came to be known as soon became very collectible and my passion grew. For me capturing a likeness isn't enough. I want to breathe life into every single subject I paint. I want the viewer of my work to feel emotion. I want them to feel a sense of life in each piece. Colour selection,techqniue and brushstrokes are only a minor part of my style. My mood, peaceful and gentle spirit seem to flow into my creations. Which I hope you can feel in the whisper of a face above. A light, gentle whisper of a painting that still says so much with so little. I feel kindness in the face,kindness is so important in this world............to capture it in a painting is truly magic. I am meeting so many wonderful artists and non artists on facebook that a wonderful friend encouraged me to open a fan page on faceebook. This was a grea idea in that people who like my work can join and interact. However it left me with a dlilema because I don't feel I should have fans or that my friends should be considered as "fans". Celebrities or famous people are entitled to have fans. See you there if you join me! 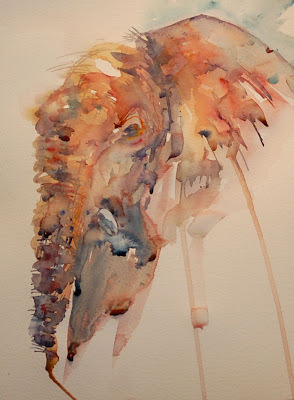 Elephant Study with no preliminary sketch. Market Street Gallery 2010 Exhibition , Alton, Hampshire. U.K. It only seems like yesterday that I was at the Private Preview of my Autumn Exhibition at the Market Street Gallery in Alton ,Hampshire,UK. Time is flying by and I am now preparing for my Spring show. If you wish to visit the exhibition or book a place on the workshops please see the following link for details. I really would love to meet you. At the end of every studio session I clean my palette so that I am ready for the next days painting.In the central well there is always a collection of the colours I have used each day. To wipe these away would be such a shame and waste of pigment. 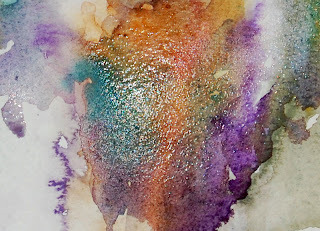 I devised a way to use this left over mix of shades, free my mind and relax by painting with them on a scrap of paper. As you can easily see they are heavily diluted in this first wash. The aim is simply to capture my subject nothing more. I am not aiming to frame any of these, just free my mind. As always there is no preliminary sketch,just colour guiding my brushstrokes. While I was working a line from the blue background ran downwatds and under the chin creating a wonderful effect of shadow. I couldn't resist adding extra detail.and stronger colour contrasts. What a wonderful way to close a day. A fifteen minute study of a face.
" Magic Faces" were part of my art career in Dubai. They were available in exhibitions and at the Hunar Gallery and Profile Gallery. They became collectible and I enjoyed painting a series of amazing faces with character in each study. Some were painted with coffee or tea in addition to the watercolour pigment. The last one I own is still in my studio and very dear to me. The dream of the owl painting has stayed with me all day. I couldn't dismiss the vision that came to me in the night. The wonderful colour combinations,watermarks and sense of texture of the downy feathers. I had to attempt to paint it again to see if I could repeat the pleasurable experience. This dream has led me to a whole collection of owl paintings. I am thrilled with how the series is forming. Ecstatic even. Todays washes and paintings are numerous but here are a few stages. My favourite owl wash. I took one of the three owls from my dream and painted it alone. This owl has my soul torn. I have several exhibitions coming up. I have several clients who I know would love this painting when it is complete but it is calling to me to keep it. It holds that special magic that cannot be defined between an artist and their art. 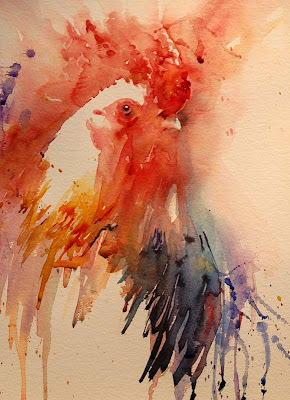 Coming to life in front of my eyes so strongly I feel the spirit of the beautiful bird in this piece. I couldn't believe the first dream painting so attempted it again with more time taken. Guided by an Angels Hand ? I felt the hand of an angel guiding me in this repeat of my first owl painting. I look at it and I feel someone else painted it. I cannot believe I have created it. I am thrilled with the result and colour. I closed the owl session with a simple piece, fast and loose to see what could happen. This one was painted aimed " at the bin" but even so it is an attractive foundation for further work. I can't wait for tomorrow.......and I do hope I dream again tonight! There are times when a subject draws you in. You feel the emotion.You see the finished painting almost as if in a dream.........I did with this piece. I dreamt about this one. It was also a dream to lose myself in Celtic music and allow images,small faces to appear as if truly by magic. This piece needs no more words.............is it finished..........I may add more but the music singing to me as it is seems peaceful and very special. Painting with magic in my brushstrokes. A little while ago I promised a January Challenge and mentioned you wouldn't have to paint the subject. 1 ) SUBJECT : Choose a Christmas Ornament before you put them away or a subjecr from a Christmas card. 2) COLOUR : Next you were asked to choose the colours you would paint the subject but NOT paint it! 3) IMAGINATION : NOW I would like you tp paint the outline of ONE side of your subject and then paint the background on this side ONLY using colours of your subject! Do NOT add any dteail and see what happens. I haven't painted my subject which is from life as I avoid working from photographs as much as possible unless I know the form well. So,can you guess what my subject is considering it isn't there? More importantly can anyone guess what YOURS is when YOU try the challenge. Let me know how you get on and I will add more challenges throughout the year to help everyone lose their pencil and enjoy painting watercolours with life! 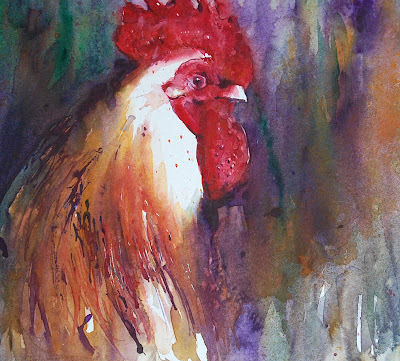 In 2009 I was elected to the SWA,Society of Women Artists as an Associate Member by handing in a collection of cockerel paintings. I was so thrilled when I heard all four paintings were accepted in the Annual Exhibition but even more over the moon to hear I had won the Anthony J Lester Art Critic Award. I will never forget the presentation ceremony or the inspirational comments given to me by the SWA and Anthony during the exhibition. Over the last twelve months I have wanted more from my art. I am a hard task master and I am aware I have a long way to go to achieve my goal of subjects actually jumping off the paper in a way that creates a sense of movement but I feel my explorations in technique to be unsual and unique as an artist are getting somewhere. I am growing as an artist and my art is evolving. My energy along with never ending enthusiasm is my constant drive to improve and please myself on how my work looks. 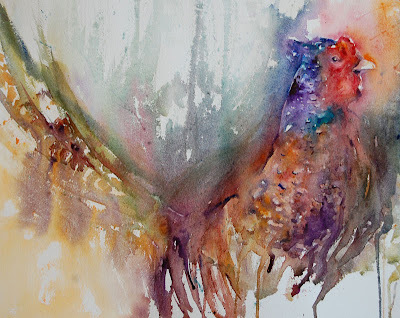 I wonder if you feel a difference in movement between the latest cockerel paintingabove finished this morning compared with the winning piece " Morning Calls " from last year. My next painting looks so exciting already and my Spring Exhibition promises to be really full of life this year.And surprises. Artist Tip: Set a goal of how you wish to improve and work towards it! Whilst everyone thought I was painting daffodils and narcissi I was painting a huge number of subjects at the same time.This keeps my brain alive and actively aware of colour. If I work on one subject there is a risk I may lose that spontaneous feeling that brings a subject to life in this technique. I have to ask you a question............how much detail do we really need to tell a story? For example can you see clearly what this is and would adding any more to the painting make this better? Of course this is a personal feeling but one worth considering. Next I will be looking at ideas for composition and put all these explorations to full use! It's time to paint! I am adding the full exercise next! 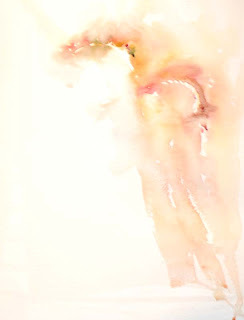 Watercolour Flow witha Light Touch. Leopard in Watercolour, Latest Stage.